When, after twenty years, Thomas returns to the home he shared with Jim, his mind is filled with memories both sweet and bitter. They were once happy there, but when Jim discovered that Thomas was a wizard, he felt betrayed enough to kick Thomas out of his life. Jim has now passed away, leaving the house to Thomas, and Thomas soon realizes that he wasn’t the only one who regretted the way they parted. With Halloween strengthening the ghostly presence of Jim in the house, Thomas might just get the chance to say goodbye… or even more. On the eve of Christmas, Hunter gets a call from his friend Cole and agrees to help him perform a magic ritual. Cole has taught Hunter to do simple magic spells, but Hunter’s feelings for Cole run deeper than friendship and gratitude, even though he doesn’t know if Cole even likes men that way. Once they are ‘locked’ in the magic circle, though, Cole has to admit that the ritual requires them to be intimate, and he didn’t ask Hunter to help by accident. 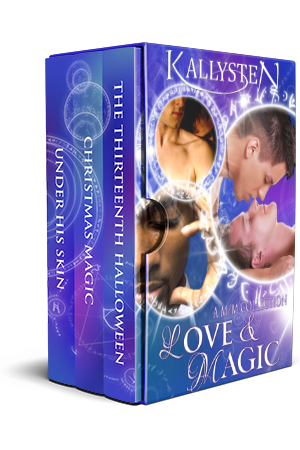 For Christmas, Nathan has the perfect gift for Joshua, his best friend and sometimes lover: his magic. Ever since Nathan found out he had magical abilities, Joshua has supported him, encouraging him to cultivate his talent, so that Nathan is now the resident mage of the local Special Enforcer agency that employs both of them. Joshua, however, doesn’t have a trace of the talent, however much he wishes he could do magic too. On a night off, Nathan offers Joshua a way to discover what it feels like to do magic by swapping bodies for a few hours. But before the night is over, their boss calls them both for back up, and the playful spell starts to cast a different light on their relationship. Will they be able to do their job and keep an innocent girl safe while stuck in each other’s skin, or will magic break them apart? NOTE – These 3 stories were previously released as separate ebooks and are now only available as a bundle.